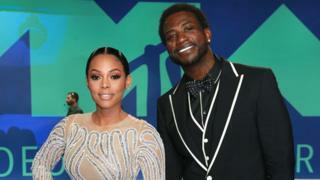 Gucci Mane, (real name na Radric Davis) just recently marry Keyshia Ka'oir, di woman wey im date reach eight years. Dem marry for di Four Seasons for Maimi, USA, according to People magazine. Di wedding wey cost reach $1,7 million gather plenty famous people from music and entertainment world. Big stars like Sean "Diddy" Combs, Karrueche Tran, Rick Ross, Monica, Big Sean and Jhene Aiko show face for di all white wedding. But, dia love story no straight and e no dey as smooth as di way di wedding day happen. For interview wey di new Mrs Davies do, she talk say im bin see her for inside XXL magazine when im dey prison for 2010 when she enter as "Eye Candy of the Year". Dis na after she don show for inside Timbaland "Say Something" music video. Na im Gucci Mane say e want am for di video wey im do when im comot from prison "911 Emergency". She gree. When dem meet, according to her, "im fall in love sharp-sharp." How dem cope when im dey prison? Gucci Mane go back prison for 2013 after im disobey rule wey ban person wey don go prison before to dey carry gun. For im book, The Autobiography of Gucci Mane, im talk say im bin wan surprise im babe with di way im lose weight. Also im don dey take drug wey be cough syrup wey na only doctors fit give. Mrs Davies talk say dem bin get standard schedule within di three years wey im dey prison, dat na wetin help dia relationship, help am lose weight and stop to dey take drug. For 2016, im carry her go one basketball match wey di Atlanta Hawks play, come propose with ring wey she say na 25 carat diamond. Even though di team wey dem support no win di match. During di kiss cam break, im just comot ring propose.